Comixology has four new comics to download for free! Not a bad line up of books! The crossover, like many modern crossovers, had some issues but I really enjoyed it. I thought I owned a copy of X-Men Gold 1 but I only own issues 13 and 30, due to Lockheed’s appearances. Looks like the first issue has a nice recap on Kitty Pryde’s origins and has some excellent Paul Smith panels and Lockheed is in a few of those so I should try to get a physical copy of it for my collection. Maybe when we go to Kelly’s Komix in Great Falls for Free Comic Book Day on May 4. Go get those free comics! A savings of $7.96! Funny how Blue doesn’t have an end date as I thought it was ending when Gold ended but maybe they haven’t updated that information just yet in their database. Now this is how you celebrate the X-Men’s 50th Anniversary. Look at that gorgeous cover by Olivier Coipel. 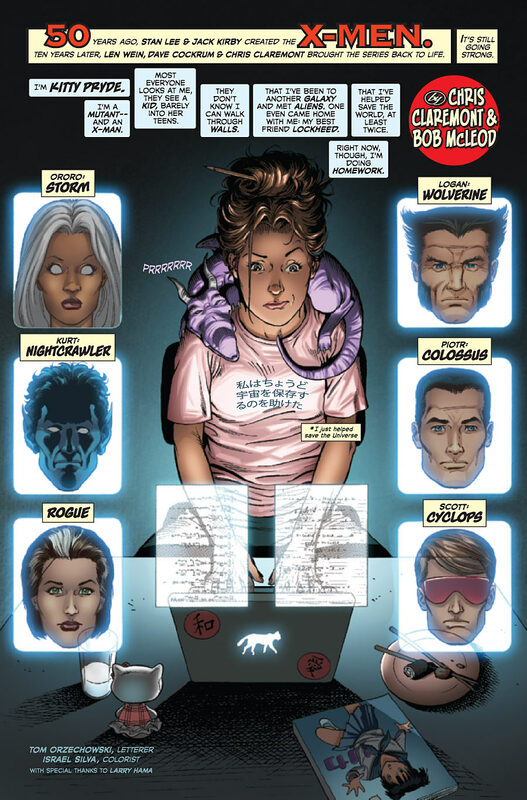 That would be a pretty good lineup as well – Kitty, Lockheed, Gambit, Angel, Jean, Bishop, Cyclops, Jubilee, Wolverine and Storm. Someone for everyone. This issue has five stories, but only one of them has Kitty and Lockheed, and that is the main attraction. This story takes place between Uncanny X-Men 173 and 174. Bob McLeod is a legend – he gave us The New Mutants, after all. But how much better would this story have been with Paul Smith on art? After all, he was that era’s original artist. This story also proves that if you give an older artist a modern colorist, their style still holds up. Lockheed is sleeping on Kitty’s shoulders while she is doing homework. She is also feeling bad about Logan’s failed wedding. She starts talking aloud about it and this is when Logan sneaks up on her. A warning alert happens, Sentinels in China and they wake the team. The two spread where she informs the team, looks as if Steve Dillon drew it. Since this is takes place after the wedding, the Starjammers were in attendance and are giving the team a lift to China. Scott still is deciding if he wants to join his father in space. Kitty is wearing that blue and white unitard, with that exta white cloth around her shoulders, not sure what you call that item. She is talking to Rogue and was about to touch her, when Rogue warns her not too. Kitty isn’t wearing gloves, but Rogue is fully covered besides her head, nothing to worry about. In China, there is a giant Sentinel. So giant, that it is capable of manufacturing proper size Sentinels – which are giants themselves. It is like an action Master Mold. The Sentinels it creates, can adapt to the situation. Colossus and Wolverine are too small, so their punches have hardly no effect. Rogue flies in and tears off an arm. That arm targets the Starjammers. The Starjammers are now busy defending themselves against a group of Sentinels, in space. Lilandra is quick to don her battle armor. Even Madelyne gets into the action and starts firing a turret. Kitty remembers her power ruins machines, as Cyclops put her on civilian duty, he doesn’t have much experience with her at this point. I can see her not speaking up. She starts fighting Sentinels, as does Lockheed. His flames look amazing! Kitty comes up with a plan – daring but also odd. She is going to phase into Wolverine, Colossus is going to twirl the combination, Lockheed is going to burn all three of them. It looks cool, all three are in extreme pain, but it works. Storm sets off a massive lightning storm and this fries all of the Sentinels. The team heads back to the Starjammers for drinks. Cute story about Beast, Iceman and Angel making fools of themselves to try to win a date with Jean. Cyclops, at Xavier’s demand, shuts that party down. Story about Banshee and Sunfire in Memphis. The story would be better if it didn’t imply it took place two days before Giant Size X-Men 1. That seems silly, but it leads into the next story. 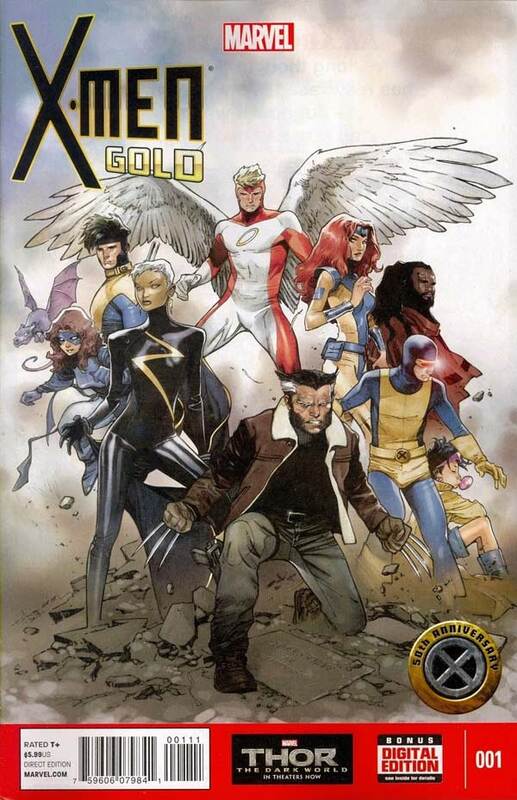 This takes place right after Cyclops is introduced to the All New All Different X-Men team, during Giant Size X-Men 1. The story is essentially, how would Wolverine kill all of these characters. The answer is, with his claws. You also get his first impressions of the team members. Funny caption about how Thunderbird is Wolverine without the cool powers. This story takes place within Magneto’s mind as Xavier shuts it down in X-Men 25. Pretty cool how Xavier wants to give him one last happy thought, even after Magneto has ripped out all of Wolverine’s adamantium. Reed Richards is there for some reason. Bastion is in the audience, hinting at Onslaught is coming. Tom Orzechowski was very busy putting the words into this issue. Issue ends with short reprints from both Amazing X-Men 1 and All New X-Men 18. How anyone who reads that snippet from 18 and not buys that issue is insane.